In 2014, Mat Franco became the first magician to win America's Got Talent. The Illusionists, a large-scale show featuring seven different magicians (none of them household names), recently started another national and international tour following a box-office record-breaking run on Broadway in 2015. Magic is regularly featured on television, perhaps most prominently in the hit show, Penn & Teller: Fool Us, now renewed for a third season on the cable network The CW. Internationally, magicians such as Dynamo (in the UK) and Lu Chen (in China) are A-List celebrities who regularly appear on TV and sell out arena shows. Magic is also making inroads in the theater scene, with shows such as Nothing to Hide—directed by Neil Patrick Harris and starring two young card magicians with a conceptual-artistic bent—breaking off-Broadway box-office records and receiving strong reviews from theater critics. A number of successful magic-themed Hollywood films have appeared in recent years, including The Prestige (2006), The Illusionist (2006), Now You See Me (2013), The Incredible Burt Wonderstone (2013), and Now You See Me 2 (2016). Finally, independent film has gotten on board with documentaries such as Make Believe (2010), Deceptive Practice: The Mysteries and Mentors of Ricky Jay (2012), Our Magic (2014), and Magicians: Life in the Impossible (2016). In light of all this, you'd expect that magic would have received some attention from art historians, art critics, and philosophers—but not so. Magic has been ignored as a sideshow "art" no more deserving of critical attention than juggling or circus acrobatics, and one of the main goals of my present research is to show that this is an unfortunate, if understandable, mistake. My interest in magic is born of the experience of magic. So, it's fair to say that a card trick changed my life. Here's how I remember it: it's 2003 in a neighborhood bar on Chicago's north side; the magician asks me to choose a card and to sign the face of it in permanent ink; after doing so, I return the card to the deck, which he then shuffles and sets on the table; next, he takes his wallet from his back pocket and, showing his hands empty, opens the wallet to display a zippered compartment; finally, he unzips the compartment and cleanly, impossibly, withdraws from it the very card I just signed. I'm speechless. Of course, I know it's a trick. The problem is that I don't see how it could be. This haunts me. Indeed, an effective magic performance can haunt you for years. It's not uncommon to hear someone recount—eagerly, and in great detail—a trick that still baffles them ten, twenty, or even fifty years later. (Good luck extracting from them as much detail—and as much excitement—about their decades past visit to the Louvre.) What explains this? Why does magic have this sort of power? Another bar—this time in Revelstoke, British Columbia. The magician borrows four quarters and places them on Bryan's palm. All four coins are clearly visible. Keeping his distance, sleeves rolled up, the magician holds out an empty hand and asks Bryan to imagine—and only imagine—giving him one of the coins. Bryan complies. The magician closes his fist and then opens it to reveal: a quarter. We look down at Bryan's palm, still in full view: only three coins. Stunned silence. Bryan: "What the hell?" A well-executed magic trick offers an experience that, in a very particular way, resists intelligibility. We are ordinarily surrounded by things whose inner workings we can barely fathom. We have only a shallow understanding of our bodies or electronic devices, much less of "simple" material objects. But this rarely gives us pause—after all, we don't expect to understand them very deeply. On the other hand, we typically proceed on the assumption that we've mastered the "naïve" physics of everyday stuff. That is, we have deeply entrenched expectations for objects such as coins will behave, and, in everyday experience, those expectations are almost always met. In this respect, everyday experience exhibits a comfortable intelligibility. But since a successful magic performance presents an event that, despite our best efforts, we cannot square with our deeply held expectations about what is possible, magic disrupts the easy intelligibility of workaday experience. No wonder, then, that it can be so memorable—and so affecting. In his 1997 TV special, David Blaine borrows a quarter from three women on a New York street-corner. [At the time of this writing, see: https://youtu.be/aW5KYq475cA]. Blaine: You know how people change the consistency of metals? Women: No. What? How they change what? Blaine (displaying the quarter): Consistency. Like if you squeeze something. If you squeeze a piece of metal, it heats up. That's obvious. Blaine raises the quarter to his mouth and apparently bites a chunk out of it. The women scream, jump, turn away, cover their mouths, hide their eyes, laugh. Blaine, holding up the mutilated quarter, sounds as though he's got something in his mouth: "Mm. Mm. Watch. Watch. Look." He blows on the quarter and the missing chunk seems to fly back into place, magically restoring the coin to its original condition. More screaming and paroxysmic laughter: "I'm going home, I'm going home. I'm going home." "I think I'm going to have my baby right here." "He bit the quarter off, and said 'pfffft' and then it went back together. In front of our face!" © 1940 Charles Addams, Renewed 1967. With permission Tee and Charles Addams Foundation. In "Funny Ha-Ha, Funny Strange, and Other Reactions to Incongruity," John Morreall presents this as an example of a visual joke (1987: 198). No doubt, Morreall is right: it's funny; and what makes it so is a particular sort of unintelligibility—or, in Morreall's terms, the "absurdity" of an "unresolved [and apparently unresolvable] incongruity." In fact, "The Skier" is not just a great visual joke, it's also a terrific illustration of the connection between magic and comedy. 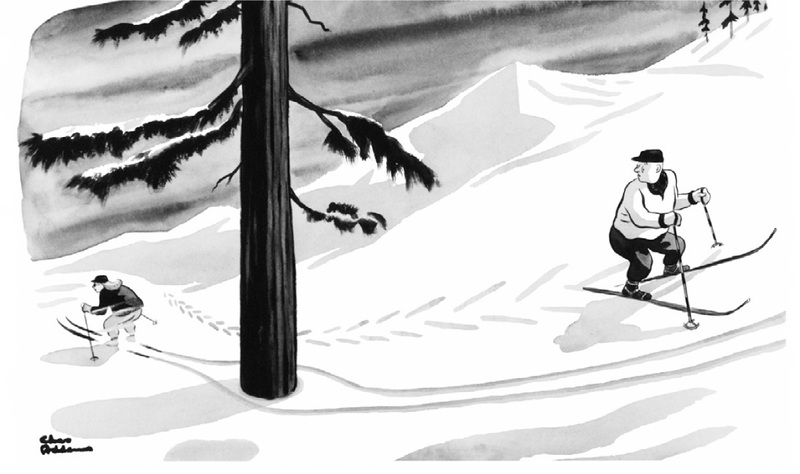 Imagine the cartoon without the uphill skier looking over his shoulder: it's no longer quite so funny. Why not? The answer, I think, is that our effort to imagine what the uphill skier might have witnessed—an effort that ends in failure—is a big part of our amusement. And it's here that there's a close relationship to magic. Imagine: David Blaine skis toward a large, isolated tree in untracked snow. Just as he reaches it, a curtain drops in front of the audience, obscuring his passage. A moment later, the curtain snaps back and Blaine, still skiing, appears to have left tracks that—impossibly—go around the tree. This would be a great magic trick. Like Addams' cartoon, its performance would all but force you to (try to) imagine: How? What would I see if, like the uphill skier in the cartoon, I could look behind the curtain? In considering this question, the mind grinds to a halt. Thus, Addams' brilliant visual joke is also a single-frame picture of a complete magic trick. As illustrated by the reaction to Blaine's street magic performance (described above), laughter is one of the primary responses to good magic. Like Addams' cartoon, magic amuses us precisely because it leaves the mind in a distinctive sort of tailspin. Oscar Reutersvärd, "Swedish Stamp images." Image © 2016 Artists Rights Society (ARS), New York. Reproduction, including downloading of ARS member works is prohibited by copyright laws and international conventions without the express written permission of Artists Rights Society (ARS), New York. Magic is not the only "art of the impossible" that's been an object of critical neglect. Representations of impossible figures—such as those created by the Swedish artist Oscar Reutersvärd in the early 20th century—afford a distinctive sort of pleasure but are rarely discussed. The experience of looking at Reutersvärd's beautifully drawn impossibilities is qualitatively different from the experience of looking at similarly well-executed drawings of perfectly possible figures. His drawings engage us in a kind of active, exploratory looking that has no easy parallel in the ways we look at "possible" artworks. Our eyes travel over a figure, not simply to see what's there, but to "feel" the impossibility and, at the same time, to work it out. In this way, the drawings stimulate a curiosity that can find no satisfaction, and this is precisely what makes them compelling. After all, as Carolyn Korsmeyer writes: "It is the momentum of curiosity that seems especially affective and invites this phenomenon into the company of emotions. It arouses what one might call a cognitive itch…" (2014: 62). That this itch can be enjoyed—that we seek it out—is evident in the fact that the best-known artistic depictions of impossible figures are featured in some of M. C. Escher's most popular lithographs; and it's hard to resist the conclusion that their appeal is in no small part thanks to the fact that they depict the impossible. That an art form whose essence is intellectual and that so often clothes itself in kitsch is terrifically popular and can provoke intense and memorable experiences is by itself worthy of note—and of further study. Moreover, it might be that studying it will bring to light a variety of intellectually-driven aesthetic experiences and even illuminate old terrain—such as humor and the sublime—in new ways. This, at any rate, is my hope. Haydn, W. (2009). The Chicago Surprise. Self-published. Korsmeyer, C. (2014). "A Lust of the Mind." In J. Levinson (Ed. ), Suffering Art Gladly (pp. 45–67). New York: Palgrave Macmillan. Leddington, J. (2016). "The Experience of Magic." The Journal of Aesthetics and Art Criticism, 74(3). Morreall, J. (1987). "Funny Ha-Ha, Funny Strange, and Other Reactions to Incongruity." In J. Morreall (Ed. ), The Philosophy of Laughter and Humor. Albany: State University of New York Press. Stromberg, J. (n.d.). "Teller Speaks on the Enduring Appeal of Magic." Retrieved April 13, 2012, from http://www.smithsonianmag.com/arts-culture/Teller-Speaks-on-the-Enduring-Appeal-of-Magic.html.